Maui Vista #2110 - Amazing new remodel!! LOW RATES! Best location! 1 br, 1 ba ground flr unit steps from pool, across street from beach, AIR CON!! 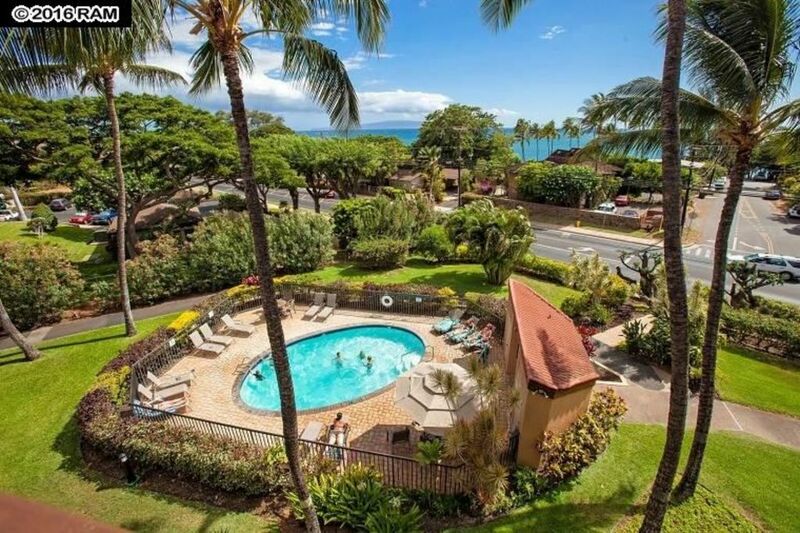 Maui Vista is one of the most centrally located condo complexes in Kihei and only a 25 minute drive from the airport. We are within walking distance of shops, restaurants and grocery stores. Across the street is Charlie Young Beach where you can view the most magnificent sunrises and sunsets you'll ever see. Historic Wailea is just 5 minutes away and Lahaina, known for it's old town charm, many trendy restaurants and shops including outlet store shopping is a 40 minute drive along the beautiful sandy shores. Our condo is a comfortable air-conditoned one-bedroom, one-bath that sleeps 4 utilizing the double-sized sofa-bed. As a ground floor unit we have an extra large Lanai with views of the garden and the swimming pool (one of three) is only steps away. Charlie Young Beach, also known as Kamaole I is only a walk across the street. This NON-SMOKING vacation condominium is one of the larger end units on the ground level in Building Two. For your total comfort, we have air conditioning and a ceiling fan to keep you comfortable. •	Fully equipped kitchen—stove/oven, refrigerator, dishwasher, microwave, small appliances (Keurig coffee maker regular coffee maker, french press, toaster, blender, rice cooker), dishes, cookware, iron & ironing board. We even supply a beach wagon to manage your beach gear effortlessly (a must if you are also juggling children!) Charlie Young Beach is one of the most gorgeous white sand beaches in Maui and known as one of the best. It is common to see Sea Turtles swimming close to the shore and Whales in the distance during whale season. ** We also have another 1br/1ba condo right next door! Please inquire if you are looking for a second place for friends/family or if this condo is not available!! There is so much to do and see just within walking distance. You won't be disappointed! After looking at many, many condos in Maui trying to find the best in terms of amenities, location, management, affordability...we found Maui Vista to encompass everything that we were looking for and at a price good enough to be able to transfer the saving on to you! This property has style, very good management, beauty, perfect location, well maintained grounds, tennis courts, pools, BBQ's and much much more which makes this property perfect. Our condo in particular has one of the biggest Lanai's and is just steps from the pool and tennis courts. As a ground floor there is no need to walk too far with groceries. It is safe for kids to play and the room itself is comfortable, clean and full of possibilities. We purchased the condo next door a year ago and we liked it so much that when this condo became available, we begged, borrowed and scraped for the money to purchase this one as well. Please let us know if you are interested in renting both! We hope you see what Kihei, Maui Vista and our condo has to offer! Kihei has much to offer. The proximity to one of the best beaches in Maui and the layout of Maui Vista with plenty of parking, pools, tennis courts and BBQ's on beautiful grounds make it an all encompassing perfect place to be. Here is just some of what you can enjoy: Kihei is beach-combing territory on Maui’s southwest shore, the sunniest, driest end of the island. Once a regular destination for sojourning Hawaiian royalty, Kihei features six miles of beaches, which offer clear views of Kahoolawe, Molokini, Lanai and West Maui. Along with swimming and surfing you can also find great snorkeling and kayaking, and you may even spot a giant humpback whale spouting or breaching the ocean’s surface. Kihei’s Kalama Beach Park has shady lawns and palm trees dotting its 36-oceanfront acres. A blink away are Kalpolepo, Waipuilani and the three beaches of Kamaole. Birdwatchers and nature lovers will find what they’re looking for at Kealia Pond on the north end of Kihei. This National Wildlife Conservation District features endangered Hawaiian stilts and coots. Also north of Kihei is Maalaea Bay, where pleasure boats launch to take visitors on whale watching expeditions, charter fishing excursions and snorkel trips to Molokini. Maalaea is also home to the family friendly Maui Ocean Center. You can also browse small shopping malls, a bustling farmers market and a spate of restaurants, all of which cater to residents and visitors alike. Nightlife here includes karaoke spots, dance clubs and sports bars ensuring your Kihei nights are just as fun as your days. The bathroom was remodeled in June 2017 with a walk-in shower, corner seat and rainfall shower head. Across the street from Charlie Young Beach. The longest and best beach in Kihei! Air conditioner in living room. Ceiling fans in bedroom and living room. Upright fan in bedroom. Pantry items change as guests leave and use items such as salt & pepper, olive oil, sugar, etc. It is recommended to check pantry prior to shopping for food. Plenty of dishes, glasses, utensils, including a full assortment of knives, bottle openers, lemon press, can opener, BBQ utensils etc. We do not provide glass wine glasses. First floor condo with wheelchair ramp from parking area. Seat in walk-in shower with detachable shower head. The condo was perfect for my needs. It’s in a great location that is very close to many eateries, shopping and most importantly directly across from the beach. It had everything needed included to maximize your experience. This place never disappoints 🤘Cant wait for next year!!! Once again we were more than happy with everything at this condo. Owners Brie & Cantrez are amazing, their response time for any questions etc is super fast. Condo is stocked with anything you could possibly need for a comfortable homey stay. Has been newly renovated with all new appliances etc. Location is amazing, 700 steps to a wonderful beach good for families as well as couples. Stores, restaurants and bars all with walking distance. Felt very safe staying at the Maui Vista there is an on-site security guard visible at all times of the day & night. Thank you for the amazing review and thank you for taking such good care of our condo! Really! You both are the perfect guests year after year! The condo was immaculate when you left! So thoughtful!! It was great meeting you both finally!! This was our first time staying in this condo at Maui Vista. We would stay in this condo unit again. The unit was clean. The bed was comfortable. The condo had nice upgraded appliances. We used all of the beach supplies which were all in good shape. The condo unit could use some more wine glasses (there were only 3) - we did buy 4 champagne flutes as there were none and we wanted to celebrate New Years in style. All in all though, everything was fantastic! Thank you for taking good care of our condo! So glad you had a great time! We stayed in many condos at this complex, and this one was very nice: starting from huge smart TV in the living room and ending with fancy shower and Koehler toilet in a washroom. High end stainless steel appliances in the kitchen and all possible small appliances including 2 coffee makers, toaster, kettle, etc. The mattress in the bedroom was super comfortable (better than my own at home). Communication with owners was very fast and efficient. The only thing that I didn’t like was that it was quite noisy in the bedroom from the people passing by and talking loudly at any time of day and night, and it was quite noisy at the lanai from the screaming children at the pool which is 2 steps away from the condo. All in all I would definitely recommend this condo to anyone who comes to Maui. Thanks for the review. We are glad you enjoyed your first trip to Maui!! The location of this condo can’t be beat! Steps from the pool and across the street from a great beach. It’s also walking distance to the ABC store and many food trucks and places to eat. The condo was well equipped and it was awesome to have all the beach and pool equipment you need. It was also so helpful that the unit had a pack and play for our 9 month old so we didn’t have to worry about bringing or renting one. The owners were very quick to respond and accommodating with our late check out so we could get in an afternoon nap before our red eye flight home. I would recommend staying here for sure! Our condo is a comfortable air-conditoned one-bedroom, one-bath that sleeps 4 utilizing the double-sized sofa-bed. As a ground floor unit we have an extra large Lanai with views of the garden and the swimming pool (one of three) is only steps away. Charlie Young Beach, also known as Kamaole I is only a walk across the street. We provide plenty of towels, beach chairs, coolers so that you don't have to bring a thing to enjoy a day at the beach. We even supply a beach wagon to manage your beach gear effortlessly (a must if you are also juggling children!) Charlie Young Beach is one of the most gorgeous white sand beaches in Maui and known as one of the best. It is common to see Sea Turtles swimming close to the shore and Whales in the distance during whale season.